Tampa Bay Security Door Gates can build you a custom security gate no matter what space you need to secure. 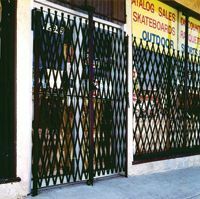 Our custom designed folding security gates can protect a single access point like a warehouse dock door or the entire frontage of a retail store front. No matter what your security situation is, we can design & build a folding gate to meet your specifications. Our galvanized metal gates can be installed practically anyplace and any way you need them configured, including… indoor door jambs, outdoor door jambs, between posts or bollards, attached to pallet racks, between walls and even on windows! And they’re easy to install. You can install our galvanized steel gates in less than 30 minutes! Keep you business safe after hours with folding window & door gates. We are the leader in custom built scissor gates and folding security gate products for over 15 years. 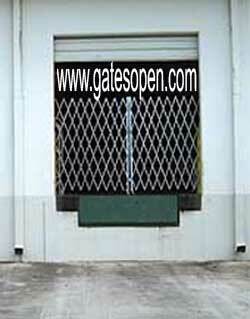 We offer a wide selection of barrier gate products for any type of opening and size including single fixed folding galvanized steel security gates, double fixed folding security gates, portable scissor security gates, dock door gates, retail storefront accordion gates, access control gates, aisle gates and more. Are you in need of a custom made commercial or industrial folding security gate? No Problem! All of our security gates can be easily customized to fit any store front security, hallway or almost anywhere. Our custom built gates can protect a single access point or provide a total front-line barrier against thieves, criminals and vandals All gate orders come with brackets, bearing washers and casters for easy and complete installation.